You wouldn’t have predicted that such a bright spark would make such a basic mistake! CEO’s and PR people learn a lot by watching politics. 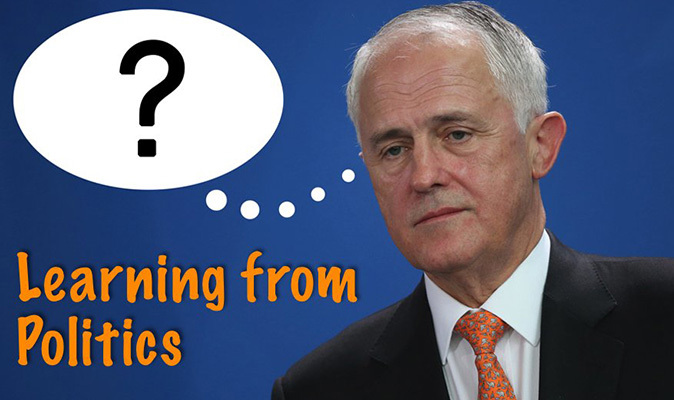 Turnbull’s polling has plummeted since being the most popular PM in 5 years. His net satisfaction rating — which measures the difference between those who are satisfied and those who are dissatisfied with his performance — has fallen to minus 10 points. Last November it was a positive 38 points. Why? Many reasons, but ten days after he replaced unpopular PM Tony Abbot we wrote that Turnbull needed to spell out his vision for the country. We said that, not because of our expertise in politics but because we’ve stressed it to CEOs time and again, leaders must ‘pipe a tune’ in order for us to follow. Failure by a leader to inspire can spell trouble for any company in a competitive market. This is clearly visible in listed companies, needing to constantly titillate shareholders, as it is also in consumer facing companies, which need to constantly advertise changes to maintain the loyalty of fickle customers. It’s the task of PR folk to ensure the message is spread, and to appropriate stakeholders. It’s a mystery why Turnbull has failed to do this. But here’s one possible reason. We have watched as Turnbull has clearly spent his energy trying to appease his party factions, but has he deliberately done that while ignoring the rest of us? If that’s the case, it’s a bizarre mistake because it’s his public support that was the catalyst for the September leadership spill, and the essential ingredient to keeping him in the top spot. While he has popular support his fractious colleagues have no real alternative but to support him. In PR some of us use a stakeholder matrix (sorry, horrible PR term) as a way of ensuring all stakeholders are spoken to appropriately. Each message or policy has to be tailored as much as possible to suit all stakeholders. Sometimes we PR folks know that’s not possible and we are left with no alternative but to satisfy one or two groups while upsetting another. BTW – this isn’t ‘spin’; it’s surprising how a serious discussion point can be dismissed as a ‘thought bubble’ if it is expressed poorly. There’s nothing unusual in this balancing act of doing our best to choose our words carefully. A CEO leading a high profile listed company will know that often the public’s interest is different from shareholders’ interests, and it’s a fine line walked to satisfy both. The positive is that if the above theory is correct, we still think Turnbull can effect a recovery and become great leader, where others have written him off. The coming election will force him to pronounce a vision, and from that may come the confidence to follow through. Next PostTurnbull’s ‘Innovation’: Cliché or game-changer?